A new entrant in the PLB wars is claiming to be the world’s smallest and lightest Personal Locator Beacon, eclipsing the current record holder in this regard, the ACR ResQLink which was just introduced earlier this year. 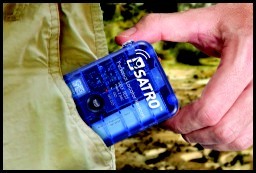 Slated to be available in Spring of 2012, the new SATRO PLB-110 from Astronics DME Corporation certainly seems to have a good basis for that claim at just 4.09 x 2.39 x 0.92 inches (104 x 61 x 23 mm) and only 4.3 oz. (122 g). While not a name familiar to most consumers, DME has been making aviation ELTs (Emergency Locator Transmitters) for 20 years with a reputation for quality and robust products. You will find many of their emergency products installed on most airliners. 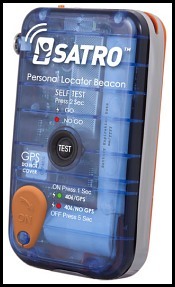 SATRO is a new brand name for their consumer oriented products, derived from the parent company’s NASDAQ symbol “ATRO,” of which the PLB-110 is the first. Unlike the other pocket-sized PLBs introduced to date, McMurdo’s Fast Find Model 210 and ACR’s ResQLink, the SATRO PLB-110 is inherently buoyant. While not an essential feature in my opinion, you should always have the PLB tethered to you if flying over water, that’s a pretty neat trick in such a small package. No need for a “float coat” to slip on to provide flotation. I had the opportunity to handle a prototype and the flat form factor, clearly modeled on the iPhone, makes it very much more pocketable than its competition. The antenna wraps around the body, similar to the ACR designs. It is equipped with a current generation 66-channel integral GPS, full GPS test function, and a flashing LED. The clear top case has a Fresnel lens molded over the LED to help spread that light wider. I’ll be interested in seeing exactly how effective that is in the real world. The PLB-110 is rated to transmit at a minimum of 5 watts for the duration of its battery life, rated for 24 hours at -20C (-4F). Its depth rating is 10 meters (32.8 ft) for 5 minutes and 1 meter (3.28 ft) for an hour. The MSRP is expected to be $299, so street price should be competitive with the McMurdo and ACR. NOTE: This device has not been authorized as required by the Rules of the FCC. This device is not, and may not be offered for sale or lease, or sold or leased, until authorization is obtained. They Keep Shrinking: Smaller & Lighter PLB From DME was written on December 9, 2011 and filed in Gear, News.